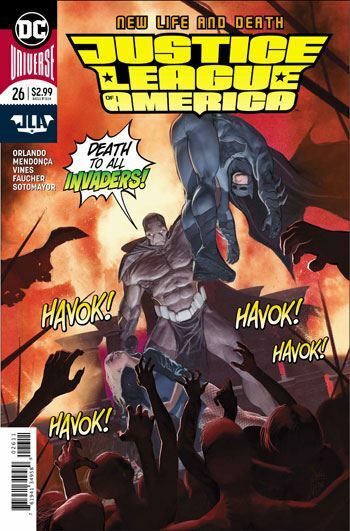 The Extremist storyline comes to a close in Justice League of America 26. In some ways, this is a very simple tale, but Orlando makes it interesting by playing on the emotions and character development of the heroes and villains. Lord Havok and Dreamslayer have always been the two most powerful of the Extremists, and the two most likely to turn on each other. Yet, as this story makes clear, they are also devoted to their home world, Angor, and determined to make it survive. The whole tale has been about trying to fix the past, without losing what one has gained in the present, a Sisyphian task at best. 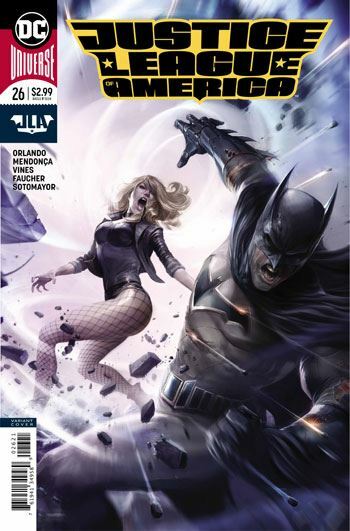 Batman and Black Canary are the only two Leaguers who get major roles in this tale. Black Canary is handled very well. From the start of this series, Black Canary’s role has been to be the bulwark against Batman’s worst inclinations, and that gets put to the test in this story. I am very glad to see her written as a strong woman, in terms of personality and ethics, able to stand up to Batman, and one of the few people he will actually listen to. In essence, the story gets resolved by tricking the villains. But is it really a trick? Everyone winds up acting to sacrifice themselves for the greater good, and the heroes’ “plan,” as it were, relies on trusting that Lord Havok and Dreamslayer are also noble at their cores. While this may not be the most action packed or dramatic issue of Justice League of America, it does read extremely well for the sincerity of the character exploration.